Canada is beautiful in any time of the year and is full of amazing destination, so our deal hunters have brought you this Los Angeles to Calgary flight for $441 r/t with taxes included. Travel in mid November with a multiple airlines flight provided by United Airlines and Air Canada and get your ticket less than with any other airline we checked.You can book this Calgary flight deal both on FlightHub and Faregeek, but it was found on Travelgrove. Search for the offer in the box below and note that the more sites you check the higher the chance you will find the best fare. 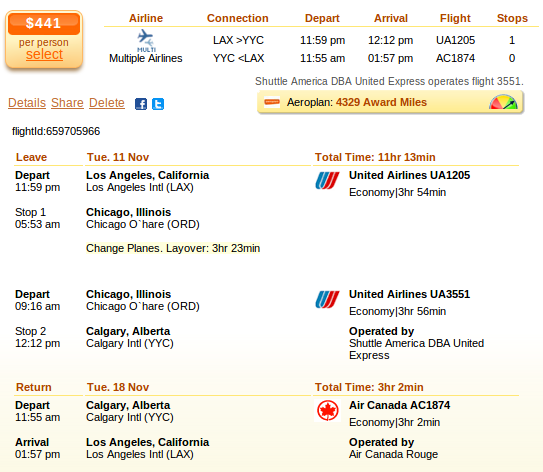 Take a look at the screenshot and see that this flight starts from Los Angeles International Airport (LAX) on November 11 and comes back a week later from Calgary International Airport (YYC). The departing flight has got a 3 hour 23 minute stop in Chicago while the return flight is non-stop. Book the multiple airlines airfare we have found and save at least $62 compared to the other offers. The second best fare that we have found is a US Airways flight for $513 r/t. You can see the top 5 deals in the table. This entry was posted on Monday, October 27th, 2014 at 3:03 pm and is filed under Airfare Deals. You can follow any responses to this entry through the RSS 2.0 feed. You can leave a response, or trackback from your own site.